I’ve always loved German Chocolate Cake. More specifically, I’ve always loved that coconut pecan frosting that traditionally tops off the cake. It’s so wonderfully sweet and nutty. And it’s the perfect way to top off a chocolate cake. So why not use that fantastic frosting to top off chocolate cookies? The thought of combining the two into a big, thick sandwich cookie was just too much to resist! The cookies I used are one of my favorites. I first made them for those incredible Chocolate Blackout Cookies. 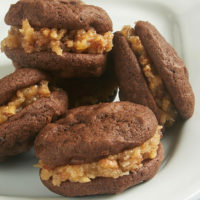 And when I decided to make these sandwich cookies, I knew those were the perfect soft, fudgy cookies for the job. Making the frosting is simple enough. It needs a little stovetop time to make a caramel-like mixture. Once that’s ready, just stir in some toasted pecans, coconut, and a bit of vanilla. It will thicken a bit as it cools, making it easy to spread on the cookies. I was not shy in frosting these cookies. As good as that frosting is, I wanted plenty of it sandwiched between the cookies. This frosting recipe makes enough for you to frost the cookies generously. There’s so much to love about these cookies. 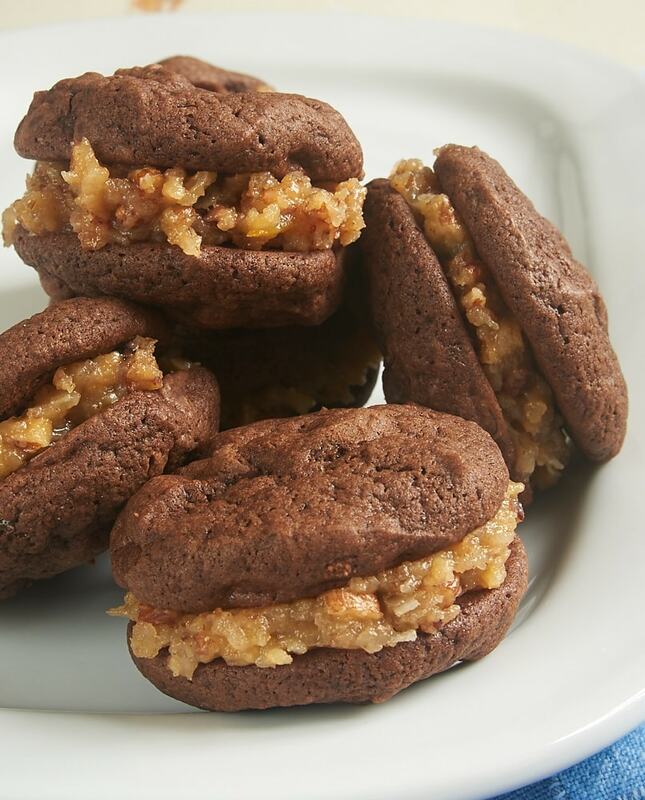 The rich, fudgy cookies. The sweet, nutty frosting. And, of course, the whole package is even better than the sum of its parts. If you’re a fan of the flavors of traditional German Chocolate Cake, then do yourself a favor and make these as soon as possible! Find dozens more cookie recipes in the Recipe Index! 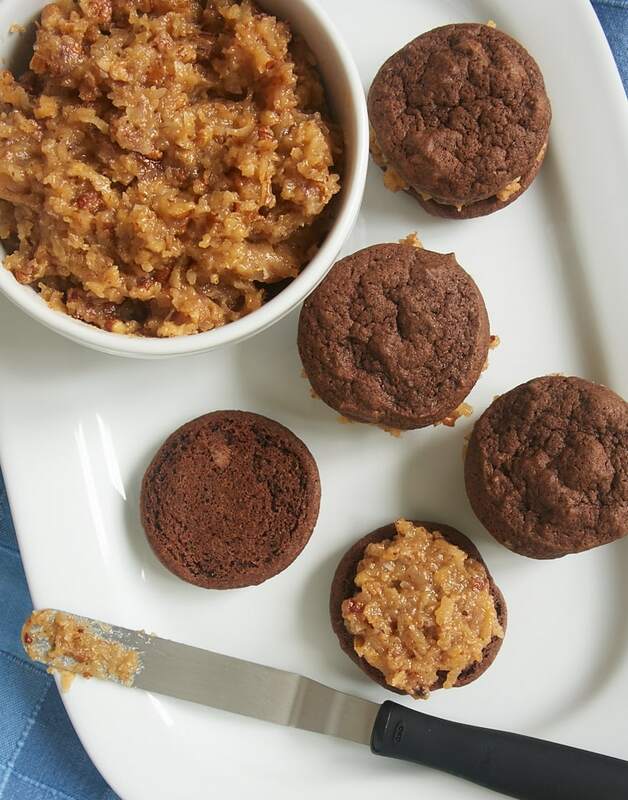 If you love traditional German Chocolate Cake, these are the cookies for you! Whisk together the flour, cocoa powder, baking soda, and salt. Set aside. Reduce mixer speed to low. Gradually add the flour mixture, mixing just until combined. Stir in the chocolate chips. Drop the dough by tablespoonfuls onto the prepared pans. Bake, one pan at a time, 8 to 10 minutes, or until the cookies are almost set with a soft center. Do not overbake. Cool the cookies on the pans for 5 minutes. Then transfer the cookies to a wire rack to cool completely. Combine the evaporated milk, sugar, butter, and egg yolks in a heavy saucepan. Cook over medium heat, stirring constantly, until the butter melts and the sugar dissolves. Continue cooking, stirring constantly, until the mixtures is bubbly, thick like pudding, and turns a light caramel color. This should take 12 to 14 minutes. Remove the pan from the heat. Stir in the pecans, coconut, and vanilla. Transfer the frosting to a bowl and let it cool, stirring occasionally, until spreadable. Spread the frosting on the bottoms of half of the cookies. Top with the other half of the cookies. Frosting recipe slightly adapted from Southern Living.